Homebrew Heroes interviews Vector Republic! Hera Primera is a work in progress Juno First clone on the Vectrex. The video shows level 1 of current test version. Please note that in the video left & right sides are a bit cut off. The author of Big Blue auctions the 200th copy of his game in a special, one off translucent teal cart shell with 2 Big Blue T-Shirts. All proceeds from this auction will go to charities. As proven many times, 256 bytes are enough for a tiny nice effect. So shown with Electric Force by realm of illusion. Also a production first shown at Chaos Constructions 2015. 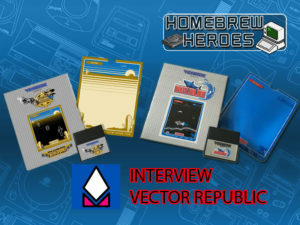 The J Game is a game for MB Vectrex, developed by Jan Haasch. Jump over randomly generated walls and keep jumping in time. What is an easy task in the first few levels, certainly gets a challenge by time. Invitron by Realm Of Illusion ranked 5th in the oldschool demo competition at Solskogen 2015. Heps Q Q is a fresh Vectrex intro by the guys from Fit. Good ol’ Pong arrived for the Vectrex! In Vector Pong by KidQuaalude you can either play in single player or two player mode. As a mini-twist there are also moving obstacles. V-Theremin is a little sound toy by KidQuaalude. Veccy Bird is a remake of Flappy Bird (which itself is a remake of several other concepts) for the Vectrex by mikiex. Thanks to Kieren Hawken for the news via retrovideogamer.co.uk.